Single Cup Design and Quick Brew System -1150Watts heating elements brew your pods fast,with preheating time as short as 10s.It also fits for 99% K-cup capsules and tea pod for your favorite flavor,60s brewing for small cup,80s for large cup. Detachable Transparent Reservoir and Adjustable Drip Tray- 27 oz visible water tank with big mouth allow you to fill water easily,brew up to 4 cups of coffee.Removable drip tray support for standard-size cups or 5 inch tall large mugs. Two Brewing Size Mode and Resetting Function-Small and big cup buttons with LED light can be controlled for 6oz and 10 oz coffee.You also can keep pressing cup button to start brewing,until coffee amount reaches that you need,release button,resetting successfully. 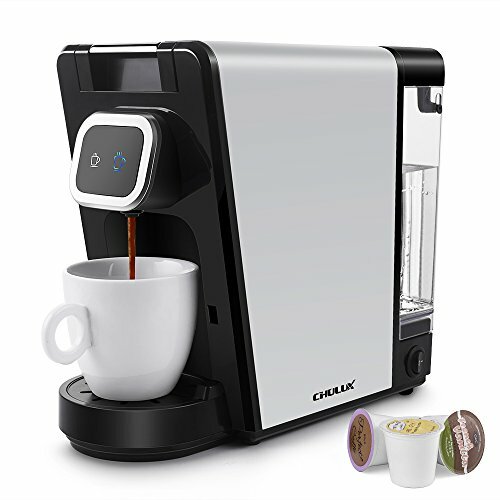 Safety Auto Shut-Off System and Convenient in Clean - The coffee machine will keep standby mode after brewing, auto turns off if no operation in 15mins.Removable Accessories(k cup pod holder, drip tray and reservoir) for better cleaning.Dishwasher safe. Quality Assurance-BPA Free material for coffee maker,ETL & FDA certification for coffee brewer give you safety guarantee,1 year warranty and customer service support within 24 hours.